What Are Laptop Cooling Pads? What Are The Best Brands For Gaming Laptop Cooling Pads? Need A Cool-Off Period? Or Ready To Buy? Sat on the cold tiles of your bathroom floor trying to cool your laptop so you can finish your deadline? Been there. An overheating laptop brings on all sort of problems. The sweat on your brow may be from the hot weather but it may also accumulate in the anticipation of wondering if your laptop will make it through and save your work in time before crashing. Fortunately, you can get off the bathroom tiles by buying a product that has been specifically designed to regulate the temperature of your laptop. We’re referring to a laptop cooling pad. 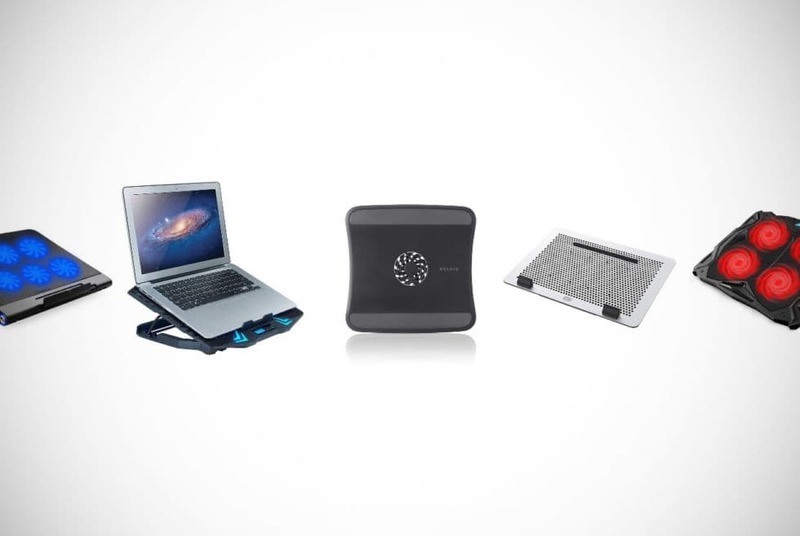 A laptop cooling pad keeps your laptop much cooler by adding more fans and enhancing the airflow of your laptop. It works in partnership with the system integrated into your laptop to help keep your laptop cool in hot weather or over prolonged use. These products are especially useful to guys who like to game. Gaming consumes a lot more energy than normal and makes your laptop work overtime. Hence the need to install a product to regulate temperature further. We’ve been researching these phenomenal products to learn more about them, but mainly to find out which models are the best and which brands are building a reputation for quality. For sure, the Men’s Gear office is a lot cooler with these products. From our research, we have now compiled a list of what we believe are the best laptop cooling pads available. We discuss the specifics and more details about laptop cooling pads towards the end of this buyer guide. Head there now and come back to the start line of our 16 favorite laptop cooling pads currently on the market. Or, if you can’t wait to see these awesome products, let’s get straight into them. Remember to hit the link to the sellers and discover more about your favorites. Look no further than Siker’s incredible design housing a staggering six fans and all the other bells and whistles as their competitors – but all for a lower price! 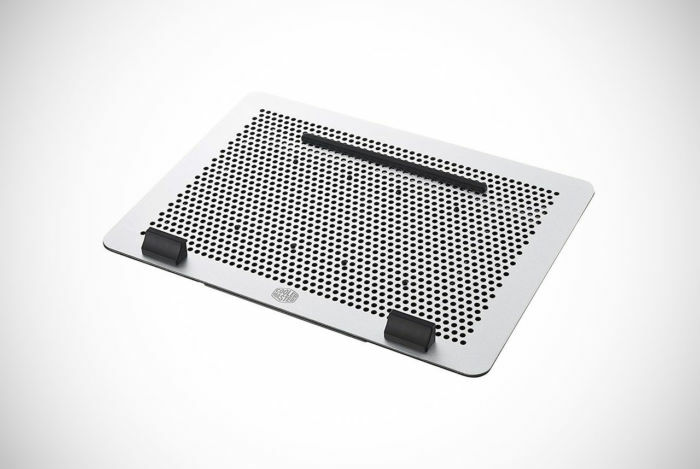 The first laptop cooling pad to make it on our buyer guide is this creation from Tree New Bee. It’s compatible with a large number of laptops due to its dimensions that cater to very small tablets right up to some of the largest laptops on the market. The design is equipped with four fans that work efficiently and quietly. You’ll never be put off your work or your game with noise when you’re the owner of this cooling pad. The item may also be tailored to your height preferences. This is done with fold-out legs that easily retract to maintain the product’s compactness. If you do like the ergonomic benefits of having your laptop at an angle, then you also get to use the anti-skid aspects which will keep your laptop secure. One of the more unique aspects of this design is that the LED lights accompanying the fans come in a green color too. Many of these LEDs – as you’ll soon discover – come in a blue color only. The second laptop cooling pad put in front of the Men’s Gear judges with success was this Kootek model. It’s similar in size to the one we just looked at, but it’s a different design. This one has a fifth fan that is positioned in the center of the pad. This larger fifth fan is just under six-inches wide, whereas the four smaller ones measure in at 2.76 inches. There are three modes to choose from too. Owners can employ the help of the central fan only, the four smaller fans only, or have all five working together to prevent you and your laptop from overheating. This model is one of the best when it comes to ergonomic height settings. 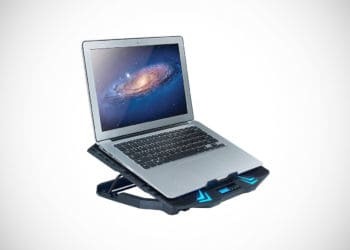 Whereas most others offer five different increments or fewer, the Kootek Laptop Cooling Pad offers six different height adjustments. When set to the steepest settings, you can use the pull-out stoppers to prevent your laptop from sliding down off the pad. These stoppers also keep it in the optimum position to benefit from the strategically-placed fans. 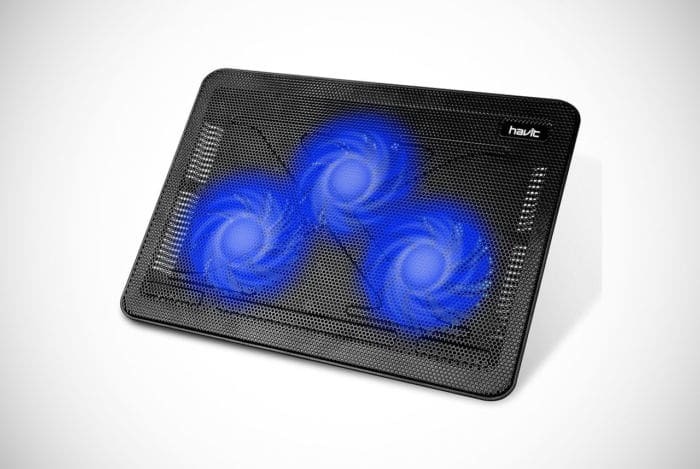 Another option for men searching for a laptop cooling pad is this design by Havit. The product is made with a sturdy metal mesh. 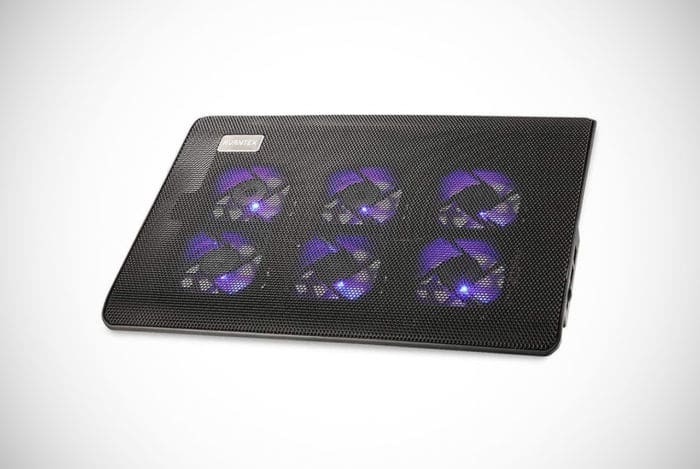 Underneath this mesh, there are five powerful fans to help your laptop regulate its temperature. Along the edges of the design is a crush-resistant material so you can pack it in your carry-on luggage and not worry that it will get damaged. 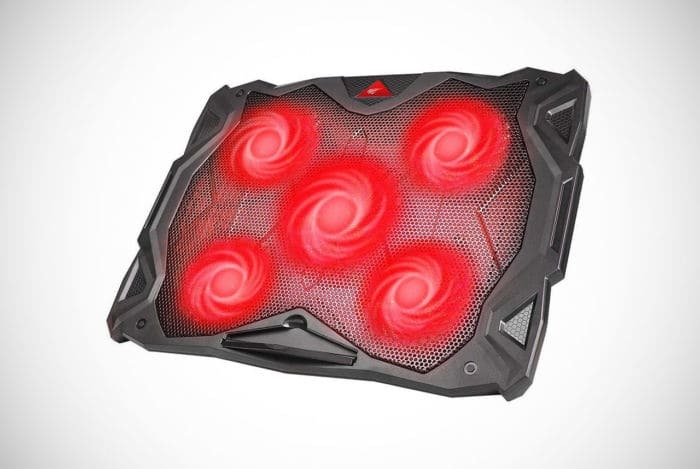 One of the coolest things about this laptop cooling pad is that it strays away from the common blue LEDs and has awesome red ones instead. As you up the speed of your fans, these LEDs will simultaneously increase in brightness. It also has an ergonomic build to help you counter neck pain over extensive use. You can adjust it between numerous height settings and ensure your laptop won’t move with the non-slip mesh and a special securing function. If you want even more fans at a below-average price, then you don’t need to look further than the Siker Laptop Cooling Pad. This outstanding piece of technological craftsmanship is sleeker and slimmer than most competing designs but will still accommodate devices between 14 and 17 inches. Its compactness makes it even better for traveling businessmen or students with a full day of studying and seminars ahead. It’s made with a mesh that works as the perfect material between your laptop’s base and six fans. Yes, that’s right. This design has more fans than most manufacturers will add and all of them work effectively and efficiently to get the job done. Furthermore, they all work quietly so you can concentrate on the deadline or your gaming mission without distractions. Another noteworthy feature is that this model may also be adjusted in height to combat neck pains. All of this at one of the lowest prices you’ll find. Hit the button below to learn even more! 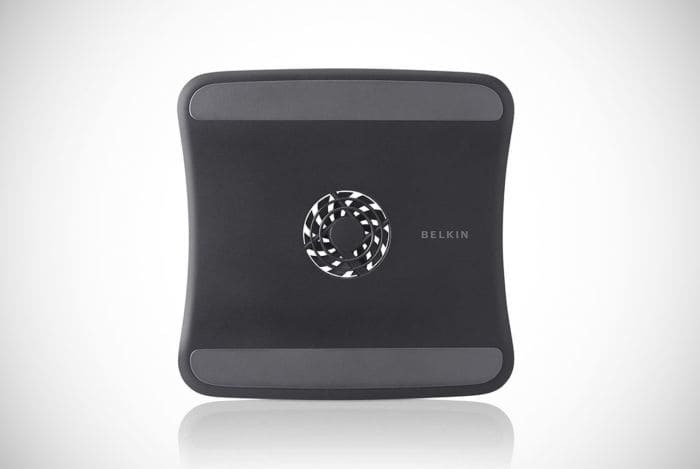 If you were starting to think that the models we’re showing you don’t have much variation, then that worry will be put to rest when you get a load of the Belkin CoolSpot Laptop Cooling Pad. Additionally, if you though the last model stepped up the game in sleekness, well, this pad has blown it out of the water. The smooth and curvy design here adds a touch of sophistication and a lot of class to your workspace. 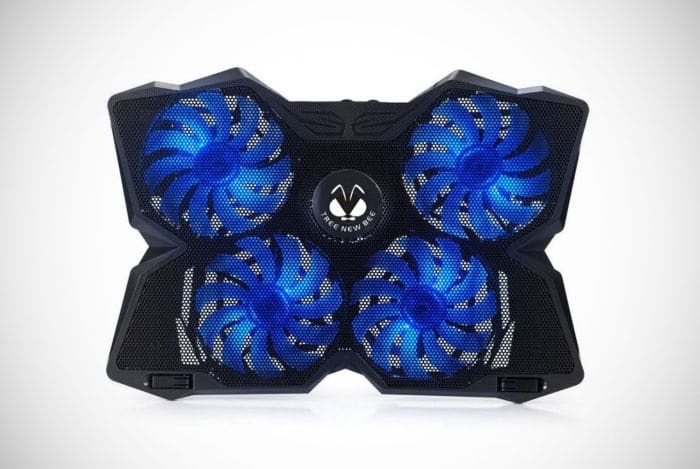 This model only has a single fan placed in the center of the design, but this fan is exceptionally powerful and enough to keep your laptop cool on its own. It also has an innovative shape which encourages airflow below your laptop. It’s slightly curved beneath so there is space between the fan and the bottom of your laptop. This allows air to pass underneath easily and cleverly regulates its temperature. 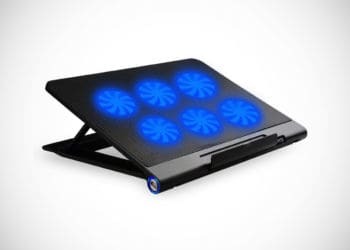 Cool Master have also taken a different path when it comes to their laptop cooling pad. 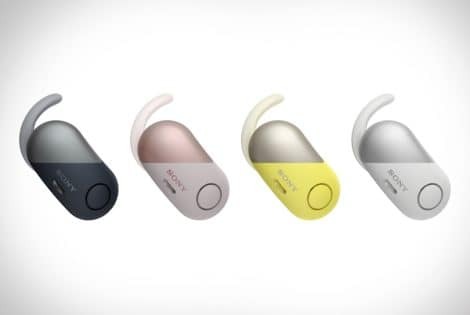 Their design is made from sandblasted aluminum, which includes mesh-like holes and is great to dissipate heat. You can count on having a cool laptop whether you’re gaming or preparing next week’s presentation with this laptop cooling pad. Some of the stand-out features here which have not yet appeared on the previous models include tailored fans and wire consolidation. What we mean by tailored fans is that the fans beneath the pad’s surface can be adjusted to the optimum position for your device. In terms of wire consolidation, this model provides grooves to insert your wires into and prevent them from getting messy or tangled. Other features that deserve to be mentioned are the pad’s ability to be adjusted up to an eight-degree gradient and a portable USB hub with more ports than many competitors offer. Vanble is another name causing a stir among working professionals, dedicated students and gamers who should be studying. 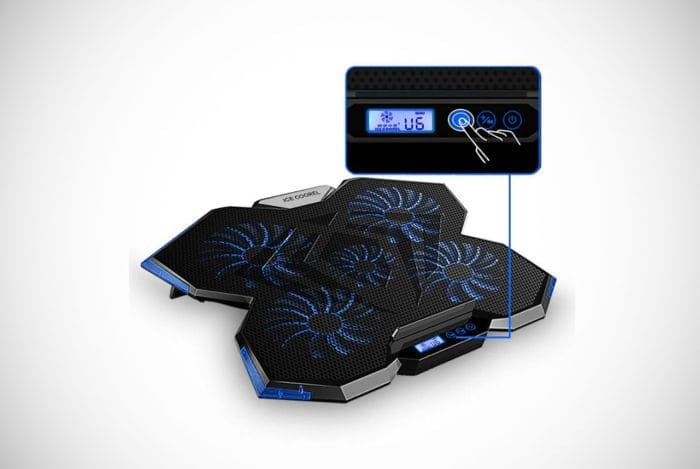 This is because they have produced an excellent laptop cooling pad which not only guarantees efficient cooling of your device, it comes in two awesome LED options. 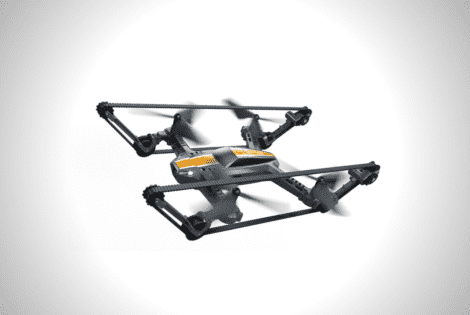 Pick up this model with fierce red LEDs or go for a calmer but just as cool set of green LEDs. It’s also a design that caters to devices of many sizes. From smaller 12-inch tablets to large 17-inch laptops, every man is covered here. The metal mesh promotes high performance and improves airflow exceptionally well. Beneath this mesh are five fans working at a rate of a whopping 1400 reps per minute. This is more than enough to prevent any potential laptop crashes at the worst times. You also manage to avoid spinal issues, back pain, neck pain and typing fatigue through the ergonomic design. The only slight drawback is that the design only offers two height increments to choose from. However, this won’t be a big deal to most guys. 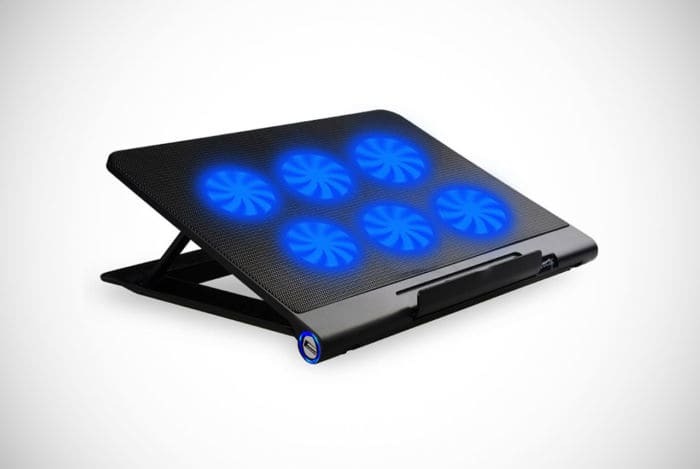 Another laptop cooling pad with LED color options is the second model we’re featuring from the guys and gals at Havit. These lot know a thing or two about laptop cooling pads which is why they have multiple places on our buyer guide. The model includes three fans placed in the most effective areas of the pad. These fans are all the same size and measure in at 110 millimeters. They provide more than adequate power to keep your tablet or laptop cool without giving off noise to distract you from your studying or work. 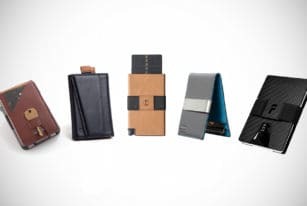 One of the biggest USPs of this design is that it is extra slim and sleek, making it perfect to throw in your Hershel backpack on the way to the office or to the airport. Other awesome features not to miss out on here are ergonomic height adjustments and a USB hub. Our buyer guide looking at the best laptop cooling pads would not be complete with this model from Tenswall. 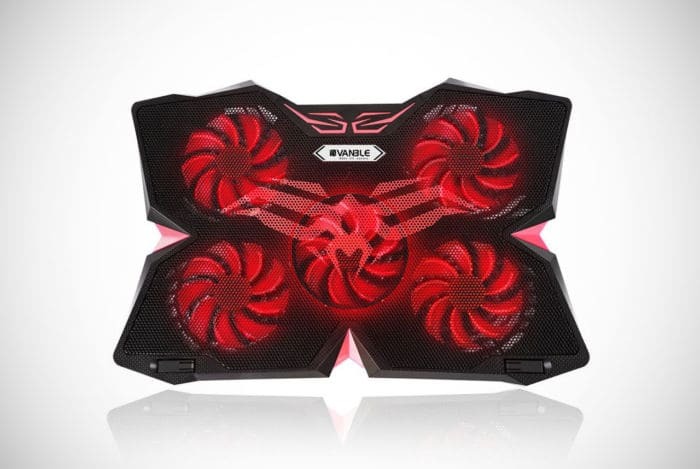 In fact, these guys also offer this design with one fewer and one more fan, so you can get their quality manufacturing with the cooling technology to suit your needs. The fans will even work at an impressive 1200 reps per minute! The one here includes four fans and they are specifically distributed across the mesh pad. In doing this, along with specific dimensions, Tenswall has created a laptop cooling pad that is applicable to a much larger range of laptops and devices. From 11-inch handheld products to large 17-inch laptops, this pad can help keep them cool. The product has been made with crash-resistant materials so if you’re carry-on luggage does go through a spot of turbulence, you know that your laptop cooling pad will remain unscathed. Aukey has almost matched the previous model in terms of its suitability for smaller laptops and larger ones. Catering to any device between 12 and 17 inches effectively is more than an admirable feat in technological design. They’ve pulled this off by including four high-performing fans. With simple controls, you can then vary the fans’ speed and the brightness of the illuminating LEDs. Here you may also choose between different height placements, so you can find the perfect typing setup or gaming views for your needs and preferences. Simply place your Apple Mac, Del, ASUS or other laptops on this sophisticated cooling throne and enjoy prolonged laptop use with no interference or unwanted breaks in work or play. One of the most appealing aspects of this laptop cooling pad – aside from its awesome features of course – is that it comes with a two-year warranty for added payment protection! 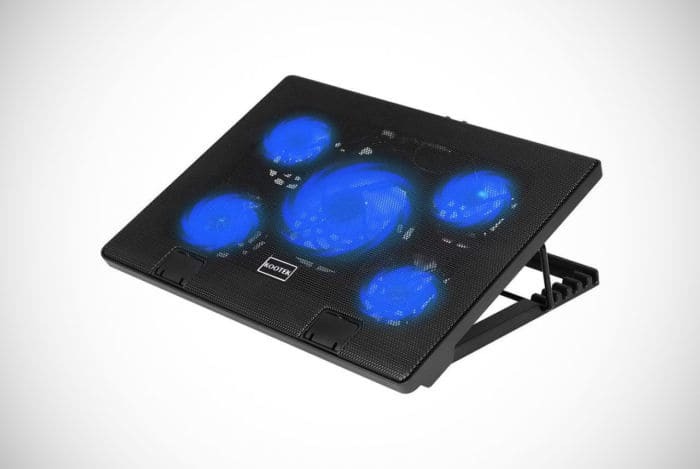 This laptop cooling pad was a front runner for our pick of the budget choice but just missed out. 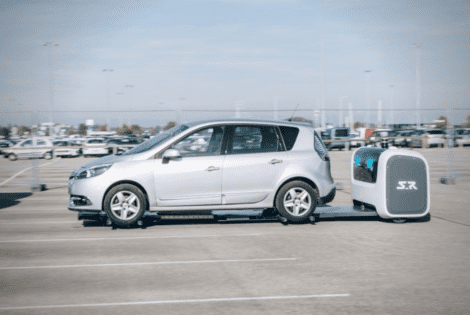 You’ll never suspect that this model is priced so cheaply because it does the same stuff – if not more – than some of the more expensive cooling pads. Aside from its shortcoming as not being suitable for laptops with dimensions above 15.6 inches, it has a lot going for it. It reverses the usual design by placing four large fans (5.2 inches) at the corners and a smaller fan (2.8 inches) in the center. By doing this the manufacturers claim that larger laptops can overhang the pad and still receive exceptional cooling – clever! Below the mesh exterior, these fans are lit with LEDs and do not make a noise because they have been meticulously stabilized. One of the best features that some of the more expensive laptop cooling pads don’t even offer is a digital screen where you can consult current fan speeds and adapt them to your needs. In fact, this pad can be tailored to your preferences through six different speeds. Click the button below to find out more about this affordable laptop cooling pad! 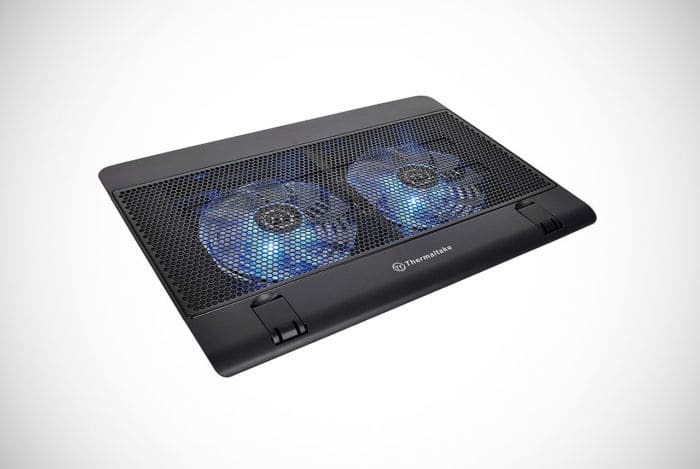 A design that is more off the beaten track is the laptop cooling pad thought up by Thermaltake. Their sleek and subtler design plays host to two fans. These fans are both sized at 140 millimeters and are located centrally. When at full power, they will reach an eyebrow-lifting 1200 reps per minute and can guarantee your laptop will never overheat. This laptop cooling pad will even be useful for much smaller devices of 10 inches and comes with a colossal three-year warranty. Easy-to-use controls allow you to manage the fans speed and their accompanying LED lights with the flick of a switch. Another feature worth column space is its ergonomic settings. 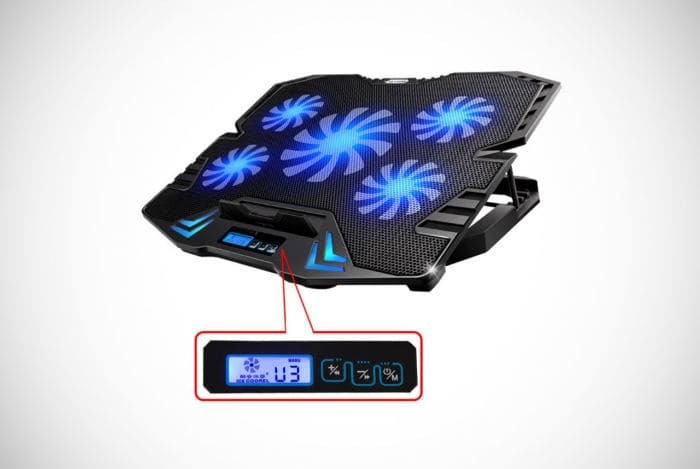 You can adjust the height of this laptop cooling pad as well. Specifically, you may choose between three different height settings to stop your fingers and neck from becoming tight or painful. When the cooling pad is at one of its steepest increments, you can then make sure your laptop doesn’t slide as you work due to built-in stoppers. The Avantek Laptop Cooling Pad is a perfect choice for men who have smaller laptops all the way down to nine inches in length. Despite not being suitable for laptops above 16 inches, not many men will be excluded here, and it certainly has a lot to offer. You’ll look as cool as a cucumber with this design’s awesome aesthetics – but what else has it got going on? 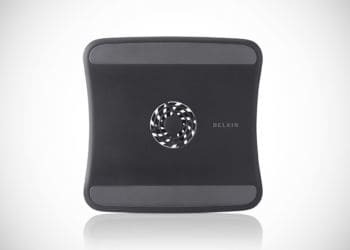 This is one of the thinnest designs on our list and makes for the perfect laptop cooling pad when traveling. It houses six fans that operate at a maximum and sufficient 1100 reps per minute. Moreover, these fans are adjustable to your needs via simple-to-use controls and operate with extreme silence. Just because it’s thinner, don’t confuse that with the pad not being as durable. The manufacturers have gone with a sturdy metal mesh that combines the need for durability with its primary function to cool your laptop down swiftly. Discover more features by clicking below! There are no reasons why any of the above laptop cooling pads couldn’t be used with your gaming laptop. They offer a number of features which will enhance your gaming experience and prevent you from having to take unwanted breaks when the action is heating up at the same time as the mercury. However, we have included a special section within our laptop cooling pad buyer guide completely dedicated to gaming laptops. These products are specifically made to cool gaming laptops which often produce even more heat than regular laptops. Let’s take a look at our three favorites. 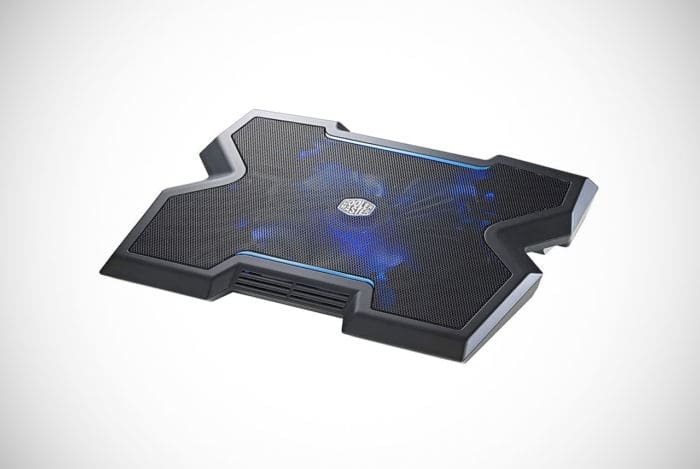 The first laptop cooling pad we will show you that has been specifically designed for laptops owned by avid gamers is the TopMate Laptop Cooling Pad. You can tell that is has been made for laptops that produce more heat because of its inclusion of five fans. Four fans are spread towards the corners of the laptop’s base while there is a larger fan positioned in the center. The larger one is made to provide even more cooling airflow and all five can be seen as they are lit up with a blue LED. The product even lets you control the fans’ speed with six different settings. All this information is displayed on a small screen. Above this control panel is a flap that extends to prevent the laptop from sliding down and off the pad. This may happen because this laptop cooling pad is tilted at an angle to enhance airflow and reduce neck pains. You can choose from four different gradients or stick with the flat option if you prefer a traditional feel. If you like the sound of the TopMate Laptop Cooling Pad but need a model that supports laptops of a slightly bigger build, then you may be in luck with this Cooler Master NotePal X3 Laptop Cooling Pad. The surface is made from a highly breathable mesh and houses a single but powerful fan. Again, like the previous model, this fan can be illuminated with a blue LED light with the flick of a switch. It also has a control center where users can adjust the speed of the fan to the desired setting. 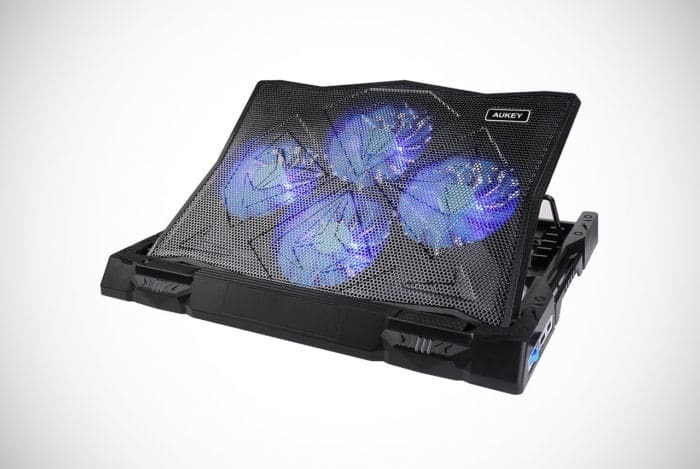 The design has been meticulously considered because this laptop cooling pad has a unique but purposeful design. The front of the design has an indented section and a front vent. This vent doesn’t just help keep your laptop cool, the breeze will also cool your hands down as you work. It outshines the previous model in some ways, but it doesn’t keep up with some competition in terms of height adjustment. It can only be adjusted between two different settings. The final gaming laptop cooling pad is quite similar to the first one we showed you in this mini-series. It’s similar in design and just as awesome. It has five cooling fans dotted in the corners of the pad with a larger fan in the center. All fans can be operated discreetly, or you can choose to light them up with LED lights. Don’t worry, these lights don’t add any significant heat to the product and counteract its main purpose. These fans can be operated in three different modes and at six different speeds. All of the fans are controlled effortlessly in its front console. Choose between different fans and their speeds to tailor its use to your needs. Other cool features include height adjustments at five different increments. This will prevent you from getting neck pain when putting the extra hours in or rushing to make a deadline. Hit the button below to find out more about our editor’s favorite laptop cooling pad! All good quality laptops are designed and built in a way to regulate their temperature. They incorporate internal fans and promote airflow out of the laptop. This is done to protect the other internal components of the laptop and prevent it from breaking down. Without these mechanisms, the internal parts of a laptop may even melt. When this happens, the laptop will need parts fixing or replacing – or the whole laptop may need to be replaced. This can become extremely costly. Gaming – many gamers tend to experience an overheating laptop because games cause the laptop to work much harder and at the same time make it more difficult for the laptop to regulate its temperature. Weather – those of you living in hot and humid climates will know too well that the weather can cause your laptop to overheat in a matter of minutes. Prolonged use – if you have to use your laptop for a long duration then it may overheat. Surfaces – if you use your laptop on a soft or non-breathable surface then you prevent the laptop’s self-regulating temperature processes from working as effectively. For example, compared to working or gaming from a desk, working from bed or with the laptop on your knee will block laptop fans and airflow. Thankfully, there is a product to help you enhance the laptop’s ability to regulate temperature and to add more cooling technology. What we’re referring to is a laptop cooling pad. These products are fitted to a laptop to help them remain cool, even when used for a long time by workers or gamers, and even when the weather is just too hot. Moreover, they also keep the user of the laptop cooler at the same time. These cool products are great for all types of guys and is the reason we’ve decided to feature the best laptop cooling pads currently on the market. So, do these laptop cooling pads work – and how do they work? These products do work, and they help keep your laptop cooler in a number of clever ways. They include a number of fans to keep the underneath of the laptop as cool as possible. These fans support the internal fan(s) inside your laptop. They are also angled to increase the ability for warm air to be expelled efficiently from the underneath and back of your laptop. Sometimes these areas are blocked by surfaces and other obstacles but by angling the laptop cooling pad there is optimum airflow. There are many benefits to using a laptop cooling pad. By lowering the temperature of your laptop and your surrounding environment there is a significantly reduced chance of your work or gaming laptop from crashing at the most frustrating time. If we lose our hard work and dedication to a goal through overheating it can be super annoying. Another side benefit is that the design of a laptop cooling pad slightly raises the laptop to give a more ergonomic design. This can improve posture and remove hand and neck pain over prolonged use. Because laptop cooling pads are a niche product, many men who have yet to be introduced to them will not be familiar with the best brands who make these items. That’s why we’ve searched around for you and found the best models from the best manufacturers, including the likes of Belkin, Tree New Bee, Kootek and Havit. These brands have built up a reputation for providing customers with ice-cool laptop cooling pads that really work. Their creations cater to different types of laptops and sizes but always maintain high standards. 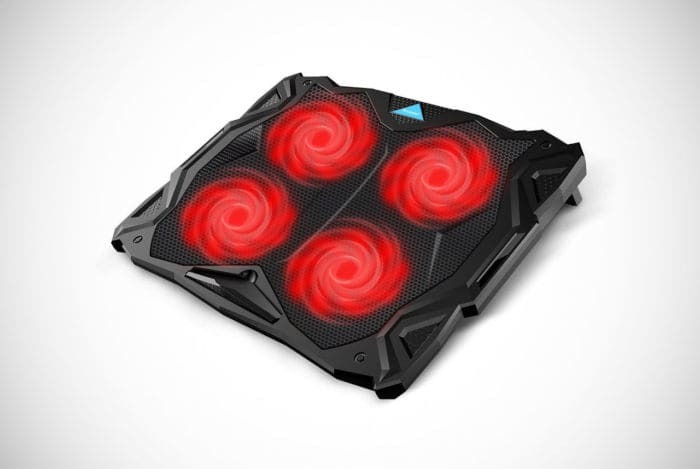 Men who like to game will benefit from these laptop cooling pads the best. This is why we dedicated a small section to gaming laptop cooling pads in our guide above. When you play a game on your laptop, compared to say writing a report on Microsoft Word, your laptop has to work much harder. 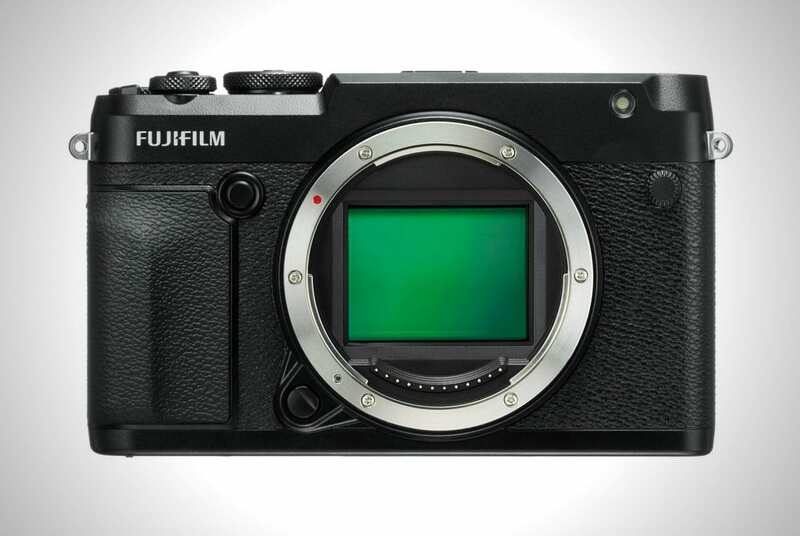 It has to provide the gamer with high-quality visuals, sounds and run at a much faster pace. Due to these things, those who game on a laptop are more likely to experience an overheating laptop. This is even more true for gamers who live in hotter states. As a result, gamers using laptops can benefit from the aforementioned laptop cooling pads from the best brands. You’re now up to speed on the important information surrounding laptop cooling pads. But just as important, you now have a list of the best laptop cooling pads currently for sale with the most celebrated and trusted brands. We’ve had the pleasure of introducing you to products from the likes of Belkin, Havit, Kootek and more. With any of the models on our list, you can’t go wrong and you’ll never risk the condition of your laptop again – even on gaming night with the guys. If you are torn between a couple of models then take some time to weigh up the pros and cons of both. We added these details within our feature list but feel free to click the links and check out each product in more detail for a specific comparison. We hope you managed to find a laptop cooling pad that suits you and your budget perfectly. And we hope to see you again browsing through awesome gear that men want and need. Now you have a cool and efficient laptop, there is no reason not to join us again in the near future for more expert buying guides.